Parenting for a Digital Future – What do parents think, and do, about their children’s online privacy? Debates about personal data and online privacy, including how and by whom data is being collected about children, are scattered across the headlines. With the rise of the Internet of Things (IoT), including AI home assistants for kids, internet-enabled smart toys and ‘sharenting’, assumptions are often made about parents’ attitudes towards digital privacy, and the privacy-related digital skills they and their children may (or may not) have. Our new research shows that online privacy is a concern for parents. Indeed, while overall, parents report few barriers that limit their use of the internet, amongst those who do report barriers, privacy is the top worry – 12% of parents say this. However, fears about privacy don’t straightforwardly translate into action. Fathers are more concerned about privacy than mothers, for example, but report fewer privacy-supporting digital skills. Parents who are more concerned about privacy also share more online, but they take steps to mitigate the risks that sharing might introduce to their children’s privacy. These findings are among those published in the third report in a series drawn from our nationally representative survey of 2,032 UK parents of children aged 0-17 years old. Previous reports considered where parents go for support with digital dilemmas and at what age parents think their children are ready to be independent online (our research methods and full questionnaire are available here). 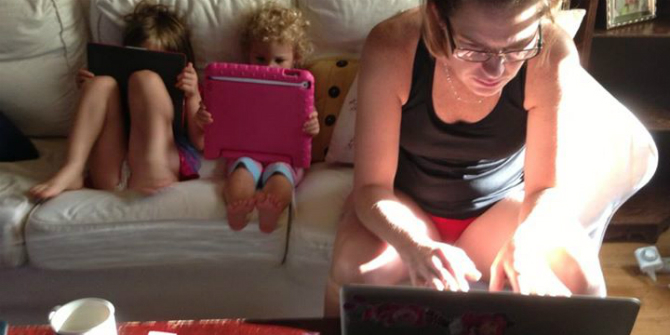 On average, children use two devices to go online. 10% of parents say their child has used a smart home device (e.g. Amazon Echo, Google Home) in the past month. They also report that 5% of their children have used a wearable device, 8% an internet-connected smart toy and 5% a VR headset. It is vital to discover the extent to which parents judge themselves and their children to have the skills needed to manage data privacy, and how parents and children are finding ways – if they are – to support children’s safety and foster their independence online. Digital privacy skills are not universal amongst parents or children – while 58% of parents say they can change their privacy settings and 53% say they can decide which information to share online, these skills are not evenly spread. Mothers report greater ability to change privacy settings than fathers, for instance, even though fathers report that they are more concerned about privacy (and though fathers report greater creative digital skills like coding and editing). Parents report that children’s skills increase with age, although there are still considerable gaps. For instance, among parents of 9- to 12-year-olds, only 44% think their child is able to decide which information they should or should not share online, compared to 56% of parents of 13- to 17-year-olds. Parents who are especially concerned about privacy share more images or videos of their child online. It seems that, for them, the benefits (for example, keeping in touch with family and friends) outweigh their concerns. Or perhaps parents want to share more but struggle to manage how to do this, leading to privacy worries. Interestingly, although parents who are concerned about privacy share more widely and more frequently about their children, they are also more likely to have asked their children for permission or to have shared at their child’s request. A few parents (5%) report they later regretted sharing images or videos of their child online. What about children’s privacy from their parents? It is a difficult balancing act for parents – both checking on their children online and encouraging their independence. Only 14% of parents of 9- to 12-year-olds, though 48% of parents of 13- to 17-year-olds, judged their child was old enough to have privacy from them online. Relatedly, on average, parents check their child’s friends or messages on social media ‘sometimes’, sometimes also ‘friending’ or ‘following’ them on social media – and they do this more often for younger children than for teenagers. This report suggests that policy-makers need to ensure that parents and children are better prepared to navigate issues of privacy online, and that industry takes seriously concerns about privacy. At present, it seems that parents and children face a Faustian pact of sacrificing personal privacy in order to take advantage of much-valued services and opportunities to connect online.